Classroom management is traditionally a matter of encouraging good behavior and discouraging bad by doling out rewards and punishments. But studies show that when educators empower students to address and correct misbehavior among themselves, positive results are longer lasting and more wide reaching. In Better Than Carrots or Sticks, longtime educators and best-selling authors Dominique Smith, Douglas Fisher, and Nancy Frey provide a practical blueprint for creating a cooperative and respectful classroom climate in which students and teachers work through behavioral issues together. From the front Cover Classroom management is traditionally a matter of encouraging good behavior and discouraging bad by doling out rewards and punishments. But studies show that when educators empower students to address and correct misbehavior among themselves, positive results are longer lasting and more wide reaching. 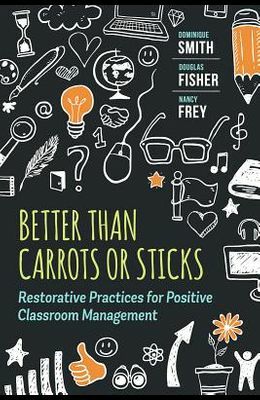 In Better Than Carrots or Sticks, longtime educators and best-selling authors Dominique Smith, Douglas Fisher, and Nancy Frey provide a practical blueprint for creating a cooperative and respectful classroom climate in which students and teachers work through behavioral issues together. After a comprehensive overview of the roots of the restorative practices movement in schools, the authors explain how to * Establish procedures and expectations for student behavior that encourage the development of positive interpersonal skills; * Develop a nonconfrontational rapport with even the most challenging students; and * Implement conflict resolution strategies that prioritize relationship building and mutual understanding over finger-pointing and retribution. Rewards and punishments may help to maintain order in the short term, but they're at best superficially effective and at worst counterproductive. This book will prepare teachers at all levels to ensure that their classrooms are welcoming, enriching, and constructive environments built on collective respect and focused on student achievement.